any single journey is just £1. 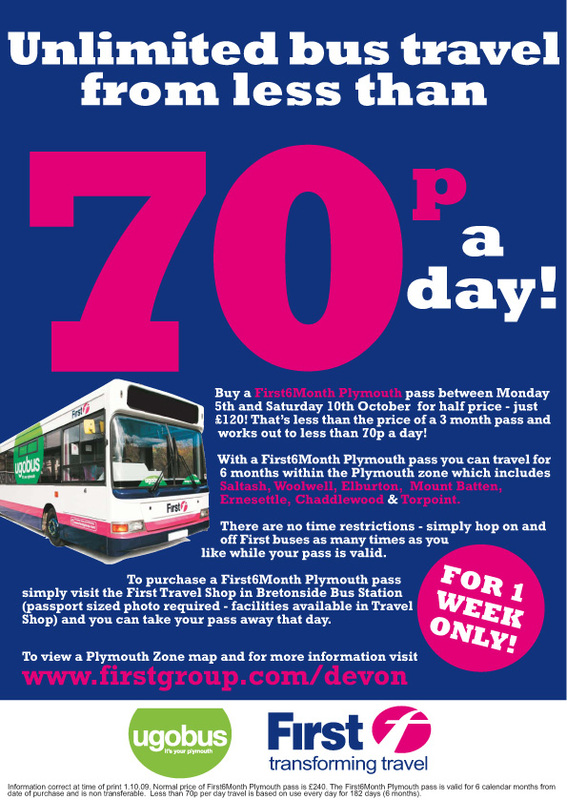 To purchase a First6Month Plymouth pass simply visit the First Travel Shop in Bretonside Bus Station (passport sized photo required - facilities available in Travel Shop) and you can take your pass away that day. The Travel Shop is open Monday - Friday 0900 - 1730 and Saturday 0900 - 1400.
from Sunday 11th to Saturday 24th October and any single journey is just £1. Whether you're travelling from the Ridgeway shops to the City, from Lakeside Drive in Ernesettle to the Train Station, from Asda in Estover to Mutley Plain or from Southway Shops to the City Centre (and all the places in between!) any single journey is only £1! Terms and conditions: The £1 single flat fare is only available on the new ugobus services 12, 13, 15 and 17 and is applicable for adults and children. Standard fares apply on all other ugobus and First services in Plymouth. Offer available 11th - 24th October inclusive. The one pound flat fare is a good deal which I am sure will be welcomed by many passengers on the new services. I know several people were looking forward to the 15 to Derriford although from my own home to Derriford on the 50 is only 80P. It also makes we wonder how many people will catch the 7 between Derriford and the City Centre while the 15 is so much cheaper. I guess we will also see something similar for the first week or so of the new Citybus 5 service later in the month.